Place the water and sea salt in a small saucepan, cover and bring to a boil. Add the buckwheat, cover, and bring to a boil again. Reduce the heat to medium-low and simmer 20 minutes. Remove, place in a mixing bowl and fluff to cool. Add all remaining ingredients to the mixing bow except the oils and soy sauce. Mix with hands. Heat oils in a large heavy skillet. Form the buckwheat into patties about 2 1/2" wide by 1/2" thick. When the oil is hot, place the patties in the skillet. Sprinkle a few drops of soy sauce over each patty. Cook for 5 minutes or until golden brown. Flip over and cook another 5 minutes or until golden brown. Serve on a bed of lettuce with any Eden Sauerkraut. 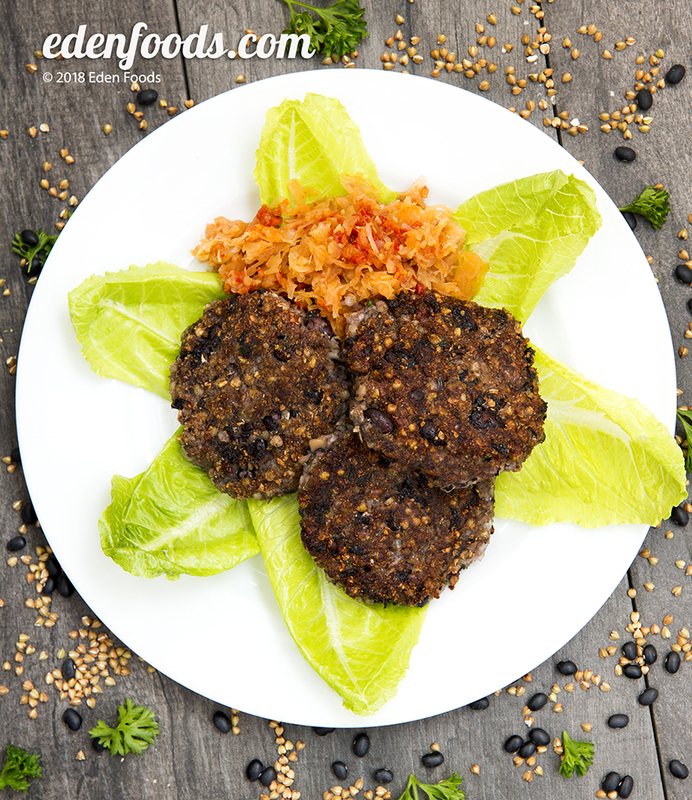 Variation: Substitute corn or brown rice flour for whole wheat pastry flour for a gluten free patty.